I've been searching for sustainable and ethical gifts for kids that encourage creativity and cost less than $20. I thought I'd share my favourite. 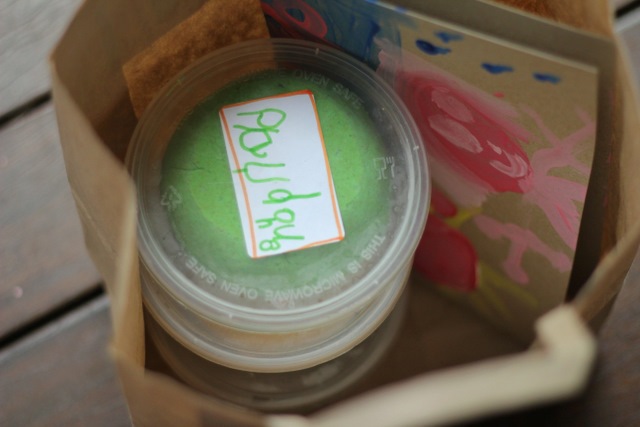 Homemade playdough is my favourite gift for kids. Little Eco and I often frantically whip up a batch on the morning of a birthday party. I make three or more colours and put it in recycled containers decorated by Little Eco. I love Makedo kits. They help kids create all sorts of amazing things from recycled materials like old bottles and cardboard. Little Eco recently tried the Makedo find & make flower kit. She now wants to make a 'forest of flowers'. I particularly like natural non-toxic paints like the natural plant based Glob Botanical Paints. This would be a great idea for gifts that need to be mailed because the paint comes as small satchels of powder. You simply put some powder in an old glass jar and mix with water. Here's another kit that encourages creative up-cycling - the Green Creativity Recycled Paper Beads kit. This tool makes paper beads from recycled paper. Little Eco is making her way though a pile of old magazines and we'll be gifting her friends paper beaded bracelets for christmas. Paper dolls are another gift idea that would be easy to post. We've made them in the past from free printables, but you can also buy paper doll kits. Gift an IOU voucher for a crafternoon - an afternoon spent creating and crafting. I know a number of kids who would love to be promised help with an afternoon of crafting. Gift a packet of flower or vegetable seeds and include a card suggesting you'll help them plant the seeds and nurture the plants. I like that colouring and activity books are clutter-free. They get used and enjoyed and then recycled. They don't need a permanent home in already crowded book shelves. Do you have any ideas for creative, frugal and eco kids gifts? [This post was sponsored by Ecotoys. As mentioned, I don't accept cash for sponsorship. Instead I barter for things I need. In this case I bartered gifts for my nieces and nephew. In addition Little Eco was gifted the Green Creativity Recycled Paper Beads kit and the Makedo find & make flower kit].